Squeeze two people, one of whom is 6 feet tall, into a 4' x 6' 1" space located lengthwise above the van cabin. With the top popped up, there is about 6-inches between your face and the ceiling. One person, the one who is 5'6" tall, has to get up and pee in the middle of the night, so she gets the edge of the bed (the side where you can actually exit or enter). This means the 6-foot tall person (Rick, haha!) is trapped in the claustrophobic "bad-boy" corner all night long. As you might have discerned, that arrangement was a grump-fest inducing NO GO! Here is what we did: We created a bed extension that slides under the original bed when stored (and the pop up can still close). 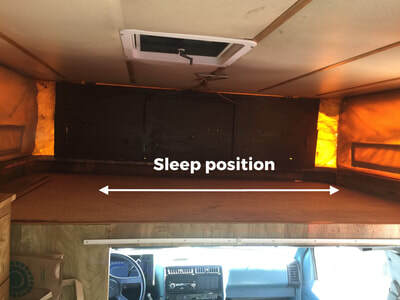 The extension pulls out to create a king-sized bed. 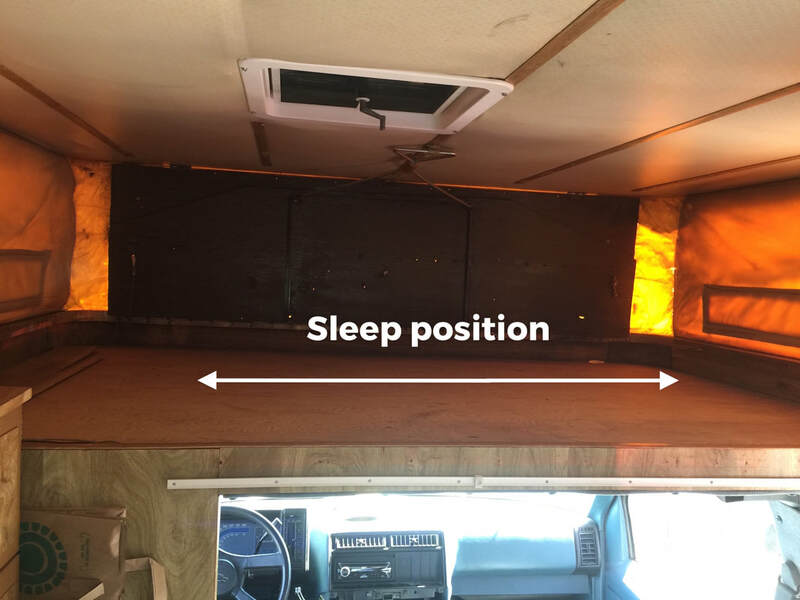 Now we sleep with our heads facing the center of the camper (feet towards the front of the van) and we can get in and out independently of each other. 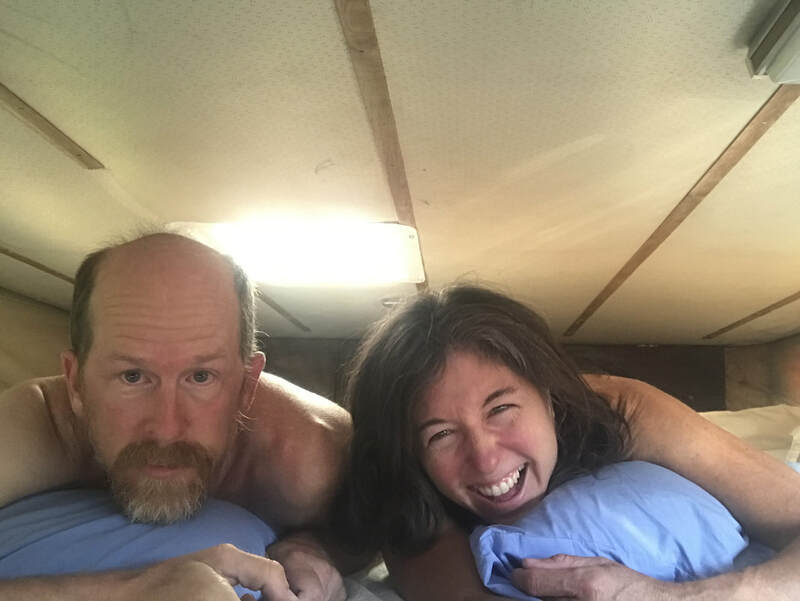 The ceiling is still close to our face, but because the center of the camper is open, it doesn't feel closed in. Here we are attempting the requisite campervan half-naked bed photo - haha! 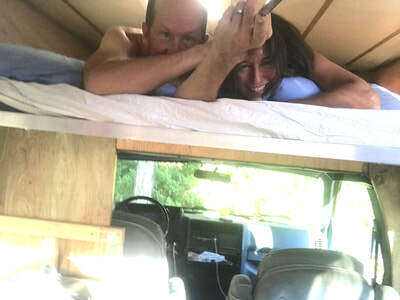 We totally can't take ourselves seriously though... geez, we are blowing the chance at the campervan money shot. 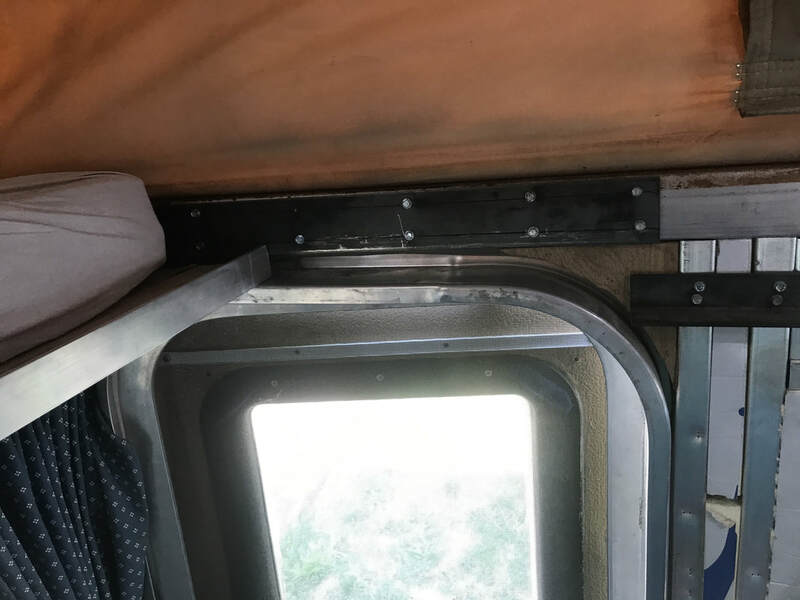 We attached two 4-foot lengths of steel angle iron extending from the edge of the bed along the campervan frame. 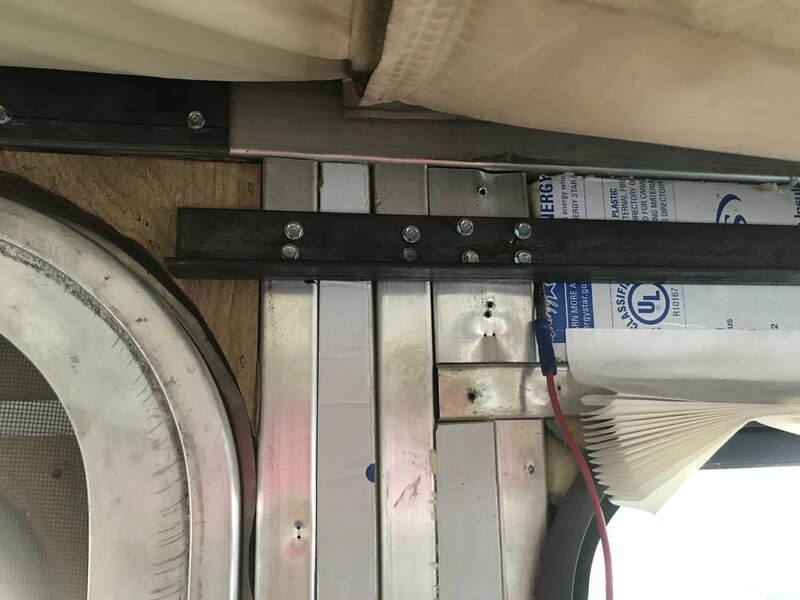 The steel was bolted onto the aluminum frame because easier to bolt steel to aluminum than to try and weld it. We cut a 1/2-inch thick plywood into 4' x 6' rectangle and attached aluminum angle iron to the outer long-edge of the plywood. The aluminum angle iron prevents splinters and serves as a handle to pullout the bed extension. We placed a piece of foam at the foot of bed. 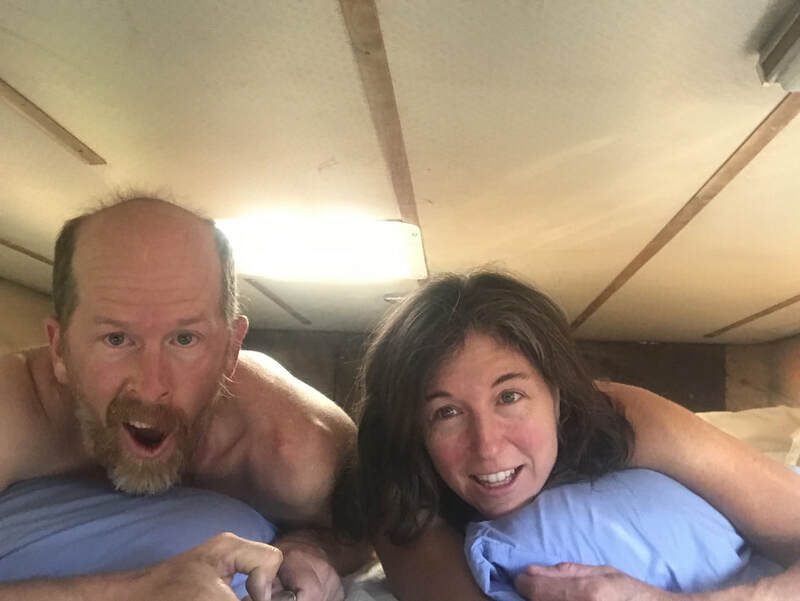 Now we have a king size bed in a tiny camper van! 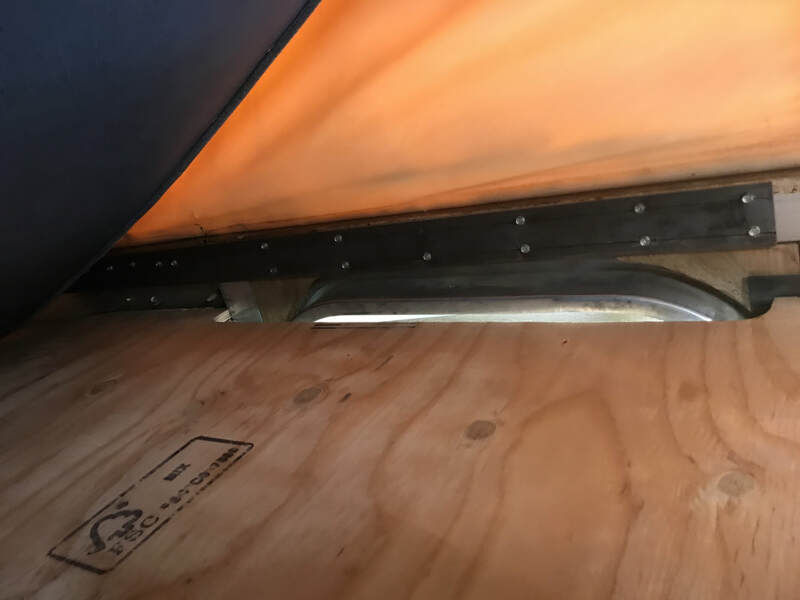 1- Bolted steel angle iron to the aluminum frame. 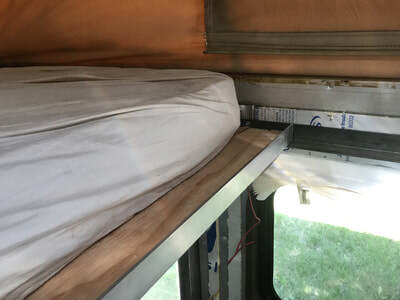 2 & 3 - The bed extension slides across the top of the camper door and then rests on the steel angle iron places on both sides of the camper. 4. We cut out a piece in the plywood to accommodate the door.